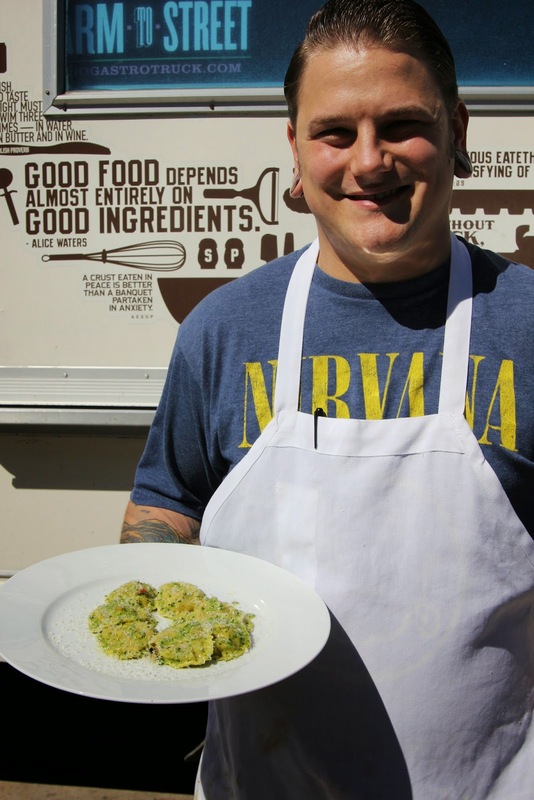 The first time I encountered Chef Ryan Studebaker was several years ago at a Collaboration Kitchen event. I can't remember who the main attraction was that evening, but there was a bit of time at the end and ringleader--much more accurate than ringmaster--Tommy Gomes spotted Studebaker in the audience and dragged him up to the cooking dais to have him do an impromptu cooking lesson in making, I believe, salmon fillets. Studebaker, at the time the chef at Gingham in La Mesa, was a great sport. Whatever fear he may have had in performing without notice in front of a crowd of 75 or so people was undetectable. He made a terrific dish and did himself proud. I wasn't the only one who was impressed with this young guy. I also fell in love with his food. 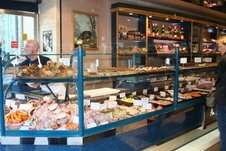 He invited me to dine at the posh Gaslamp restaurant Encore Champagne Bar and Dining Room, his next gig, and prepared some stunning dishes that clued me into his range. There was the New York Strip Carpaccio. The Potato Gnocchi with Lardon. Braised Pork Cheeks. And a lovely Scottish Salmon. Oh, and dessert? Yes, he does dessert. Like an Apple and Black Fig Tart. But Encore didn't make it. 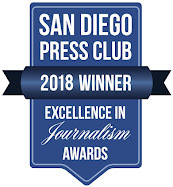 Now, this Michigan native who learned to cook at his dad's restaurant and got his first job in San Diego at Mr. A's, is running the kitchen at MIHO. Originally a top food truck in San Diego, Studebaker explained that the business is branching out to events and catering. Weddings now make up 70 to 80 percent of their business, but they are also engaged in large events, like the upcoming Art Alive at the San Diego Museum of Art in April. So, MIHO Gastrotruck is transitioning to A MIHO Experience that includes The Vetted Table, the business' catering arm. Studebaker is relishing this new gig. "There's so much more I get to do than in a restaurant," he says. "For instance, I get clients who want something they've seen somewhere else, like a slider. But I couldn't find any great slider buns, so I started experimenting with making my own. I tried four times and failed before finally succeeding. Now I'm the bread master! I love those opportunities we have when we're a little slow to do research and test recipes." 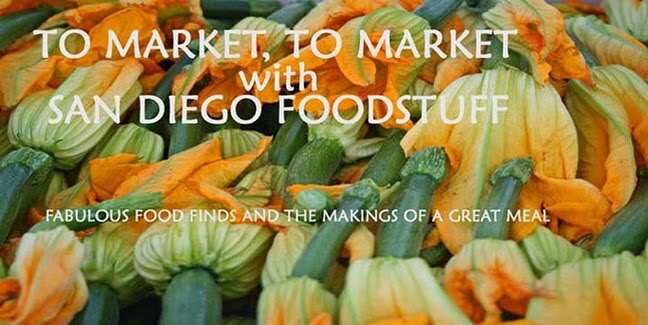 That includes making his own pastries, which is a pressure situation given that he's married to one of San Diego's premier pastry chefs, Rachel King of NINE-TEN. Friend him on Facebook or follow him on Instagram to watch his progress. 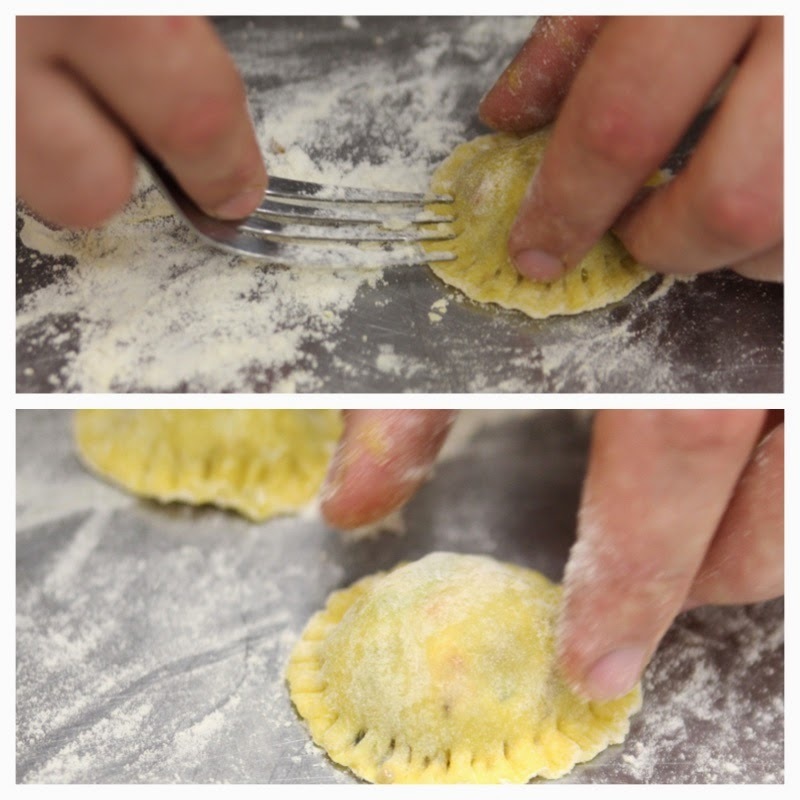 I finally got into the kitchen with him last week and he showed me his tricks for making a sublime roasted vegetable and goat cheese raviolini--a dish that will actually be a passed app at Art Alive. Anytime you roast or saute vegetables, get the color you want first before seasoning. Cooking pulls out the water from vegetables and your seasoning may get pulled out with it--and you won't get the color you're after. 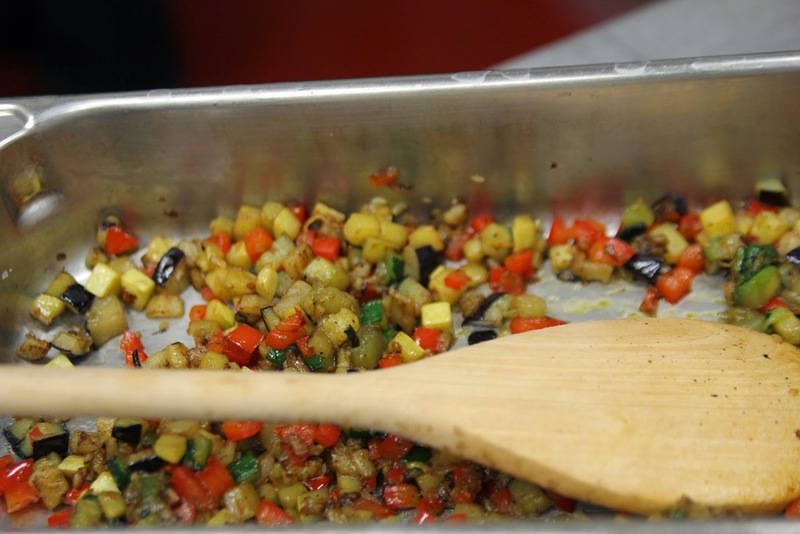 Studebaker oven roasts the vegetables for this dish, but for this small batch he sauteed them. Individually. "Saute vegetables one at a time because different vegetables cook at different rates," he says. "You can oven roast a variety of vegetables together as long as they have a similar density." To saute or roast the vegetables use a 75/25 blend of canola oil and olive oil. "Olive oil can be too strong a flavor and it will smoke once you reach a high heat. Canola oil creates a more neutral flavor for you to incorporate other herbs and spices and it has a higher smoke point." This dish is hugely flexible--in the type of vegetables you use and the pesto. For the pesto, use your favorite recipe and substitute traditional pine nuts with pistachios and you're good to go. Preheat oven to 475 degrees. Toss the vegetables, garlic, and shallots in the oil mixture and spread onto a heavy baking sheet or pan. Roast until caramelized. Alternately, you can saute each of the vegetables, including the shallots and garlic, separately until they begin to brown and then mix together. Let cool and drain. Once the vegetables reach room temperature mix in the goat cheese. Set aside. 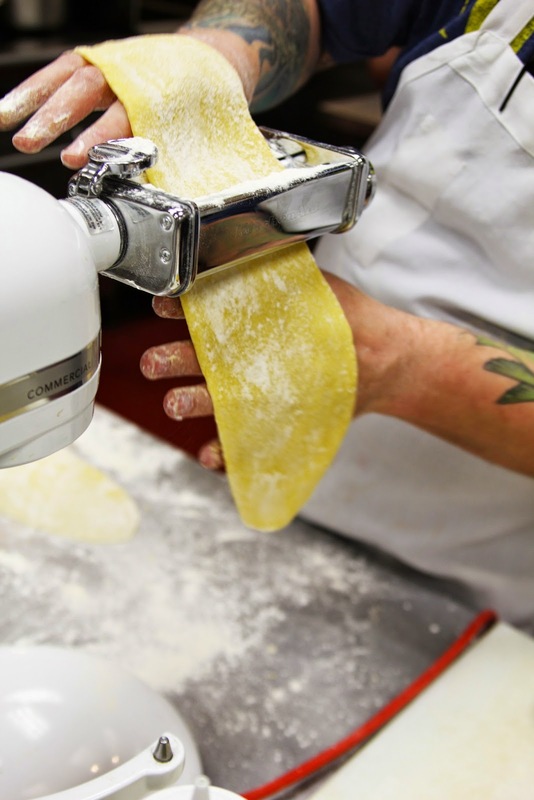 Let's address making the pasta, which is the one issue many home cooks will find intimidating, although Studebaker calls it a labor of love. I videoed Studebaker in two crucial steps so that you can see how simple this actually is. On a clean and dry table or counter, create a well with flour. (Studebaker suggests making the well wide so you have more room to move your hand and not break the wall.) Pour yolks, egg, olive oil, and milk into the center. Using your finger, break the yolks and begin swirling without spilling over the edge of the well. Continue this motion while occasionally pushing small amounts of flour into the center, making sure you're slowly incorporating the flour to avoid lumpy dough. Once the dough begins to pull away from the table, begin adding flour more quickly by sprinkling it over the top and kneading. Continue kneading the dough until it has a nice sheen. The kneading process can take 10 to 15 minutes. The dough is ready when you can pull your finger through it and it snaps back into place. You cannot over-knead this dough. Wrap in plastic and let rest at least one hour before rolling out. If refrigerated, let the dough come to room temperature before handling. Now you're going to put it all together. Using a pasta machine or attachment, set the stop at number 1. 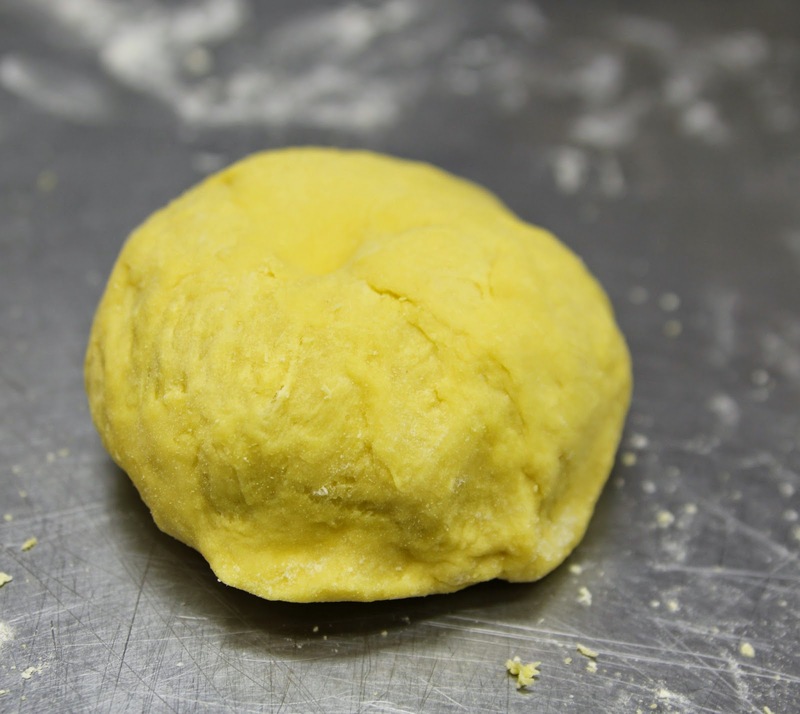 Pull off a chunk of dough and flatten it so it fits into the opening and run it through. You'll do this four times, increasing the stop each time until you reach number 4. Bring a large pot of water to boil. Add plenty of salt. Make a wash with egg and water. 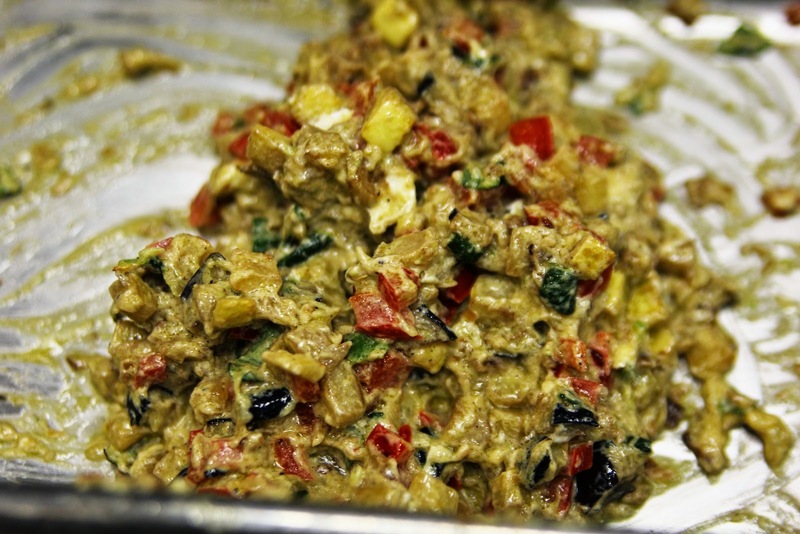 Place about a tablespoon of filling in mounds along one piece of dough. Gently cover with a second piece of rolled out dough. Then gently push the top dough around the filling mounds and push out any air. Lightly brush with the egg wash. 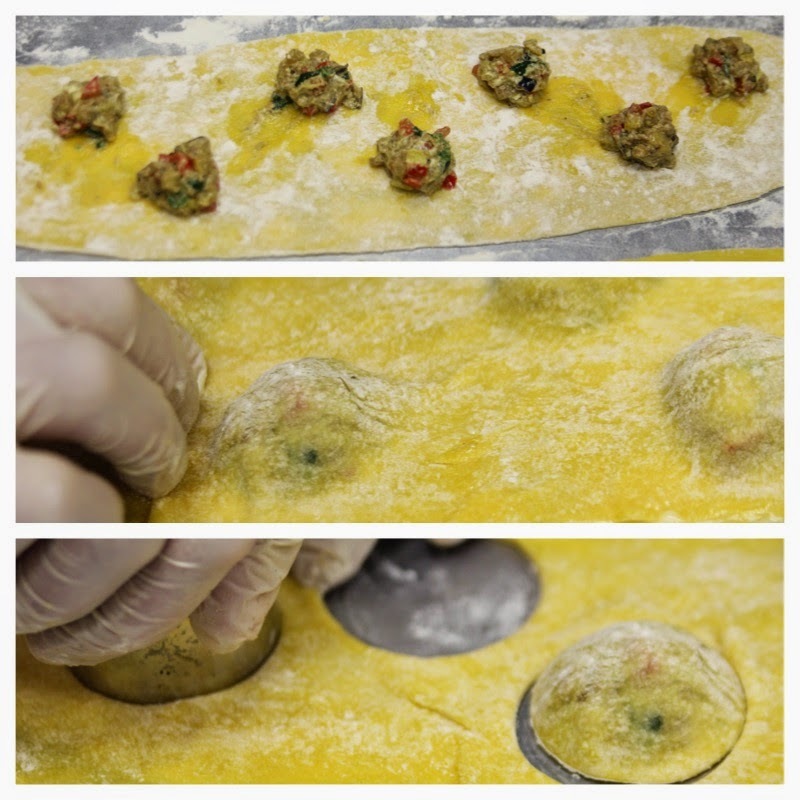 Using a round 2-inch cookie cutter, cut each of the raviolini circles. Using a fork, press the tines gently around the edges to seal. Boil the raviolini about two minutes and drain. 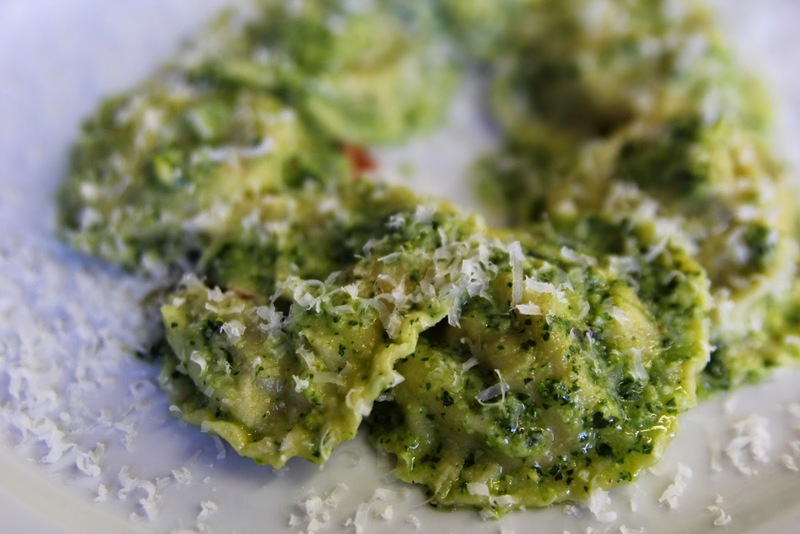 Plate the raviolini, top with pesto and freshly grated parmesan.